Amaranth is naturally gluten-free, a complete protein, and is by all accounts high in fibre, iron and calcium. Also really great in patties like these. Native to Peru, the tiny seeds of amaranth are often popped and eaten as a sweet treat. You might be more accustomed to eating the leaves as spinach, but it’s a fabulous nutty ‘grain’ that you can add in to other things you already enjoy – like steamed rice mixed with some amaranth and quinoa. It has a somewhat sticky, gelatinous consistency when cooked, so it’s perfect for adding a handful to soups or in patties like these. Amaranth is naturally gluten-free, a complete protein, and by all accounts is high in fibre, iron and calcium. Makes about 12 patties. (Double the recipe to stock the freezer or feed a crowd). Cook the amaranth and red lentils together in 2 cups of water, simmering with the lid on once they come to the boil, for about 15 minutes. Allow all the water to be absorbed. It won’t look very pretty, but a lovely mushy combination perfect for making some patties. Let it cool and steam off. Meanwhile, finely dice the sweet potato and steam or boil in a little water until soft. Lightly mash and add to the amaranth/lentils. Add the spices, salt and freshly ground pepper. 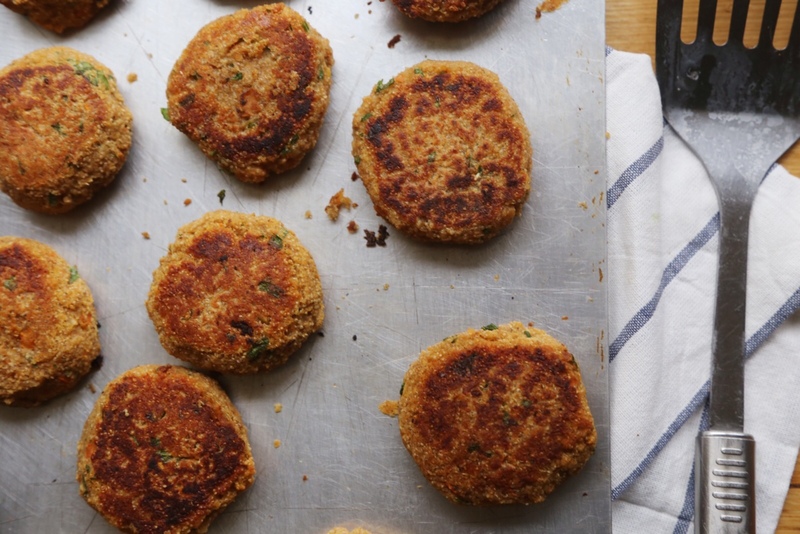 Mix in the chopped parsley, lemon juice and enough breadcrumbs to be able to shape into patties. Pop the oven on 180ºC. Using your hands, form the mixture into slightly-larger than golf ball sized balls. Heat a little ghee or coconut oil in a fry pan and fry the patties for 3 minutes on each side, until they are golden. Transfer to a tray and give them another 10 minutes in the oven. Great with a lemon, garlic, tahini yoghurt sauce. Ground flaxseeds can replace the breadcrumbs if you are looking for a gluten free option.